Strategy execution management often appears linear. Tasks and projects are completed, KPIs recorded, and business gained or lost. In reality it is an interlinked set of activities driven by the full support of the board and C-level officers. 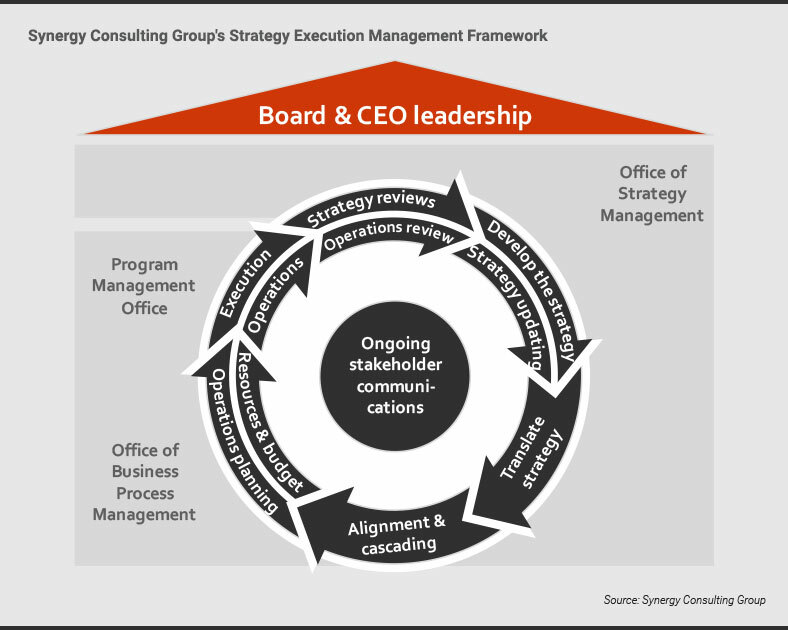 Its governance model includes close cooperation between the Office of Strategy Management and Program Management Office in a cyclic process, supervised and sponsored by the company Board, and built around ongoing stakeholder communications. It is common for organizations to develop strategies that they then fail to execute. It often stems from good intentions. For instance, ambitious firms fail to account for corporate resources and pursue too many goals at once. Or the goals are poorly integrated or do not reflect the primary mission and value of the company. In many cases, execution itself is the primary challenge. Even when the strategy suits the organizations, firms get hung up on translating and aligning the organization’s diverse moving parts, leaving business units and individuals unsure of how to proceed. Or the strategy execution loses momentum as management and staff gravitate back to old approaches and ways of thinking. It may also end up underfunded, as the strategy and its resulting action plans was not properly accounted for in the budgeting process. And many organizations fail to integrate human resources into the strategy execution management processes, resulting in staff or skills shortages in the critical areas required by the strategy. Strategy execution also fails from lack of management’s cross-functional leadership. Individual managers, directors, and even C-level officers may be dedicated to strategy execution. But they too often lack the time and knowledge to effectively coordinate their plans with other operational and business units. The first step of any strategy execution management model is strategy formulation (or updating an existing strategy) begins with in-depth analysis of the external business environment and a fearless assessment of internal resources and capabilities. The analysis includes a detailed, as-is evaluation of corporate functions (such as HR, finance, procurement, IT, legal, compliance, and so forth). It also includes an examination of strategic business units and potential synergies across the enterprise. Inputs from strategic and operational reviews are used to further refine existing strategies already in action. This crucial step of a robust strategy execution management process is often omitted by many consulting firms; and is thus a key reason strategies fail. We begin with the detailing of a long-range financial plan that quantifies the strategy. 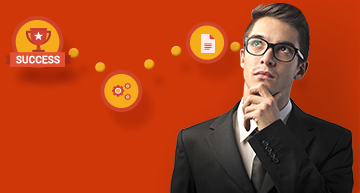 This sets the stage for developing the corporate strategy map with its interlinked strategic objectives, for defining strategic risks, and for creating and setting of corporate-level strategic KPIs and related targets, and for prioritizing of the strategic initiatives needed to achieve the strategic objectives. The strategic funds (Stratex) needed can then be reassessed and quantified along with clear statements of risk per strategic objective. Finally, we help you detail out the prioritized strategic initiatives and bulletproof them against a checklist of common missteps. Organizational alignment around the strategy must go beyond just the commercial units. This is another critical step in the linking of strategy to execution. We help your management team take the strategy maps and align to it the Board of Directors, business units, and functions. Using a series of workshops with key staff across the company value chain, we ensure KPIs are systematically defined for business units and functions. We help you develop unit- and staff-level targets, initiatives, and scorecards. The final step is to set-up incentive models that include financial and non-financial rewards. This step of the strategy execution management process starts with identification of the strategic processes that drive the target operating model. We identify and prioritize the processes that are critical for successful deployment of the new operating model. We also help you create dashboards to monitor the processes and integrate budgets and resources. Two of our main value-adds is that we anticipate the impact of strategy on operations, and we engage with budgeting and HR to assure financial and human resources will be available. The actual execution of strategy is based on the successful initiation and completion of the prioritized strategic initiatives. Utilizing the Program Management Office (PMO) , and integrating its activities closely with the Office of Strategy Management (OSM) as the orchestrators of the strategy execution, we help you define and execute the approach, handle resourcing, and assure the quality of the strategic initiatives execution – all to ensure strategic initiatives and day-to-day operations are in harmony. We use a balanced scorecard to help you set up quarterly strategy reviews that examine the status of strategy execution. Within these reviews, we examine the root causes of progress, and corrective action for any negative results. Reports also include action plan updates and rigorous use of data analytics in monitoring and updating the corporate strategy and the execution plan. PMOs come in many shapes and forms. Depending on the maturity of the organization, we assess the form of PMO needed to ensure strategy execution. From supportive PMO, to controlling or Activist PMO, we help set up the target PMO operating model and authority within the organization. The objective is to drive tough decisions across different functional areas that may fear change. As the key orchestrator of the strategy execution management process, the Office of Strategy Management (OSM) is critical to the governance of the strategy and strategy execution. We help you set up or optimize your OSM capabilities, operating model, and authority within the organization. We work closely with company leaders to create a comprehensive communications plan. A Communications plan ensures leadership, functional units, business units, and staff stay abreast of strategy execution and its management. We help you set plan objectives, identify stakeholders, define key messages and media, set timelines and budgets, and produce the messages. Finally, we help assess the effectiveness of the communications plan.